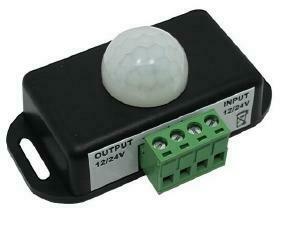 - Control your 12V DC devices using a motion sensor detector. You can control LED, CFL and Regular 12V DC light bulbs. Animal feeders can be controlled so it will not waste food when animals are not around. Delay time is cumulative. So, if you the sensor keeps detecting movement it will not shut off. After the last movement is detected the sensors will shut off after 1 Minute. Delay time is also adjustable from 1 minute up to 10 minutes. - Delay time: After detecting movement the module will output a signal triggering the sensor to switch lights ON. Delay time is cumulative. So, if you the sensor keeps detecting movement it will not shut off. After the last movement is detected the sensors will shut off after 1 Minute (or the delay time you have adjusted to). - It will turn ON when brightness is less than 10 Lux. 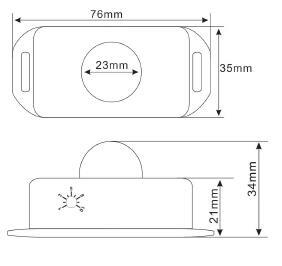 - Don’t exposed the unit to direct sun light, wind, vibration, heater or air conditioning. - Don’t fix it at a place where there are obstructing material (e.g. Glass, dense clothes) which Infrared cannot get though. - The first time the unit is powered, it will need about one minute for initialization. During this time the signal triggered by the module will not be stable. After one minute the module will work normally. - The sensitivity for left-right direction is better than up-down direction, so please make sure the installation direction is left-right. - Connect the load wires (light bulb) first following by the power wires. Please ensure short circuit cannot occur between connecting wires before you turn on the power.